For the past year we have been tracking the development of the controversial issue of smoking in apartments. The point of contention hinges on whether the renter has a right to smoke within their apartment versus the rights of neighbors to clean air in their apartment. 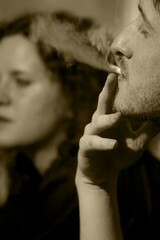 Each time we come across a story regarding smoking in apartments, the actors in the conflict change. The last time we checked in, the argument was resolved between tenants, though in a court of law; a couple living in an apartment in Dublin, California requested and was granted a temporary restraining order against a smoking tenant. Our prediction is that many of these disputes will be settled by the apartment owner, as was the case recently in Santa Cruz. The owner of the San Lorenzo Park Apartments recently informed its tenants that no smoking would be allowed within the building. This presented some of the elderly residents with quite a dilemma: either find somewhere else to live or quit a lifelong habit. Though they may raise cane amongst their fellow residents, there will not be much that they can do, as smokers are neither protected by Fair Housing laws nor are likely to be considered to have a right to smoke under precedents set by rights to privacy. With the percentage of smokers decreasing and even those who do smoke not wanting their apartments smelling like an ashtray, apartment owners are increasingly seeing incentives for instituting smoke free policies. MyNewPlace.com is a dynamic online marketplace for apartment rentals, featuring a free-to-use apartment finder to search its database of over six million listings. For more, see Matt DiChiara’s feature, Clearing the Air: Smoke-Free Apartments.